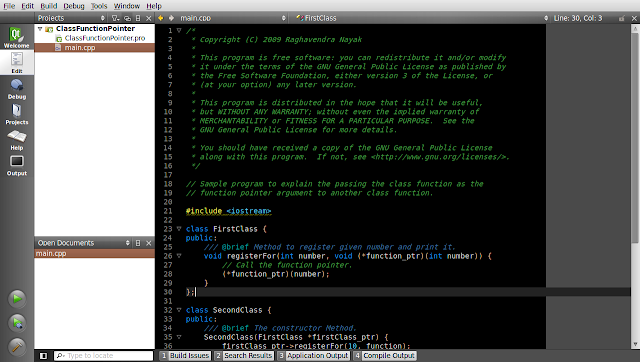 Here is my own Dark color scheme for Qt Creator. I have named it as Dark Knight. To use this color scheme, download this XML file and follow following steps. Documents and Settings\<user name>\Application Data\Nokia\qtcreator under Microsoft Windows XP. Place the downloaded XML file in this directory. Goto Fonts & Colors settings. 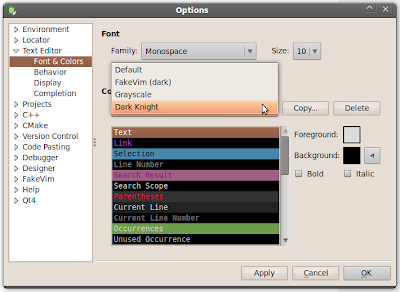 Scroll down and select the new color scheme named Dark Knight. Note: As Qt Creator is in active development, above mentioned steps may not work with future version of Qt Creator. I hope you people like it. Suggestions & comments are welcome. Technorati tags: OpenGuru.org weblog, Qt Creator, Dark Color Scheme. Works with QtCreator 2.0.94 on FC14. I like the high contrast. Thanks for this Raghu.